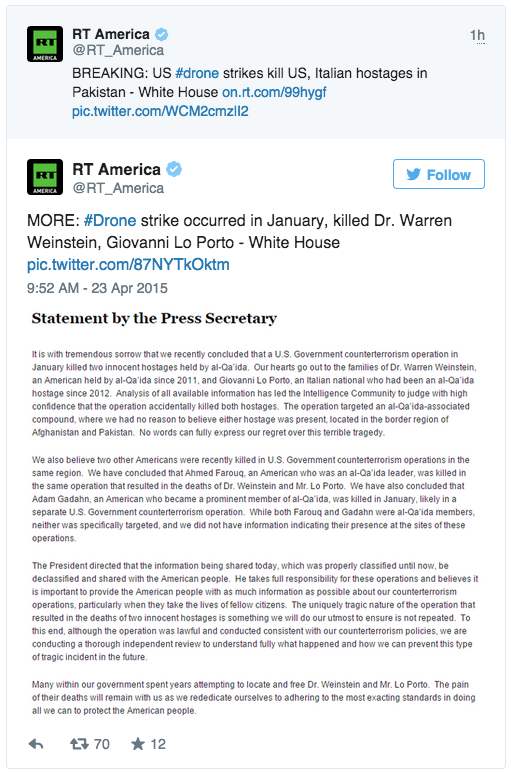 Why are U.S. drones killing American and Italian hostages? The White House says that two hostages, an American and an Italian, died in Pakistan earlier this year as the result of a United States-launched drone strike that also killed two US citizens involved with Al-Qaeda. “It is with tremendous sorrow that we recently concluded that a US government counterterrorism operation in January killed two innocent hostages held by Al-Qaeda since 2011,” reads a statement released by the White House press office on Thursday morning. Officials say that an attack in January against a suspected terrorist compound caused the death of American development expert Dr. Warren Weinstein and Giovanni Lo Porto, an Italian aid worker. “On behalf of the US government, I offer our deepest apologies to their families,” Obama said. Two Americans considered by the US government to be prominent members of Al-Qaeda were also killed during counterterrorism operations in the same region, the administration said. Ahmed Farouq, an American considered by the US government to be an Al-Qaeda leader, was killed in the same strike that caused the deaths of Weinstein and Lo Porto. The administration has also concluded that Adam Gahan, “a prominent member of Al-Qaeda,” was killed during a separate strike that month. “While both Farouq and Gadahn were Al-Qaeda members, neither was specifically targeted, and we did not have information indicating their presence at the sites of these operations,” the White House said in a statement. Obama said that the US was never aware that either Weinstein or Lo Porto was being held at the compound that was struck. “Based on the intelligence that we had obtained at the time, including hundreds of hours of surveillance, we believed that this was an Al-Qaeda compound, that no civilians were present and that capturing these terrorists was not possible,” he said on Thursday. The White House says it has already launched an investigation into the incident, the results of which may prompt the administration to revamp its drone program. The death of Weinstein is the first known instance in which a US drone strike has accidentally caused the death of an American hostage. 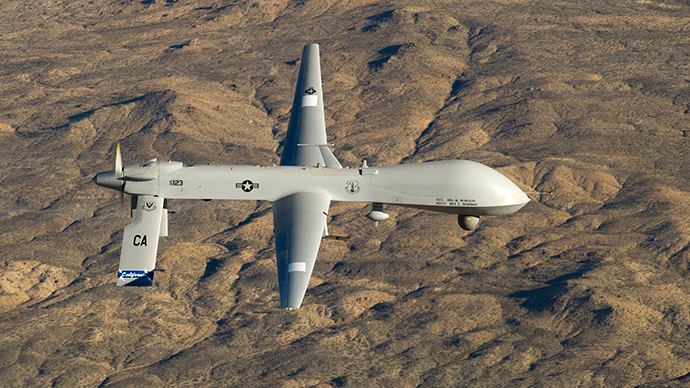 Previously, the White House has admitted that drone strikes waged by the US in 2011 had killed two suspected members of Al-Qaeda with American citizenship and one of their teenage sons, also a US citizen. Weinstein had been a member of the Peace Corps and later the United States Agency for International Development, Obama said on Thursday. He had been working as a contractor for USAID helping Pakistani families escape poverty when he was abducted in 2011. The president said he spoke earlier this week with Weinstein’s widow, Elaine, and the prime minister of Italy. CNN reported that Pakistan’s Ministry of Foreign Affairs had no immediate comment.